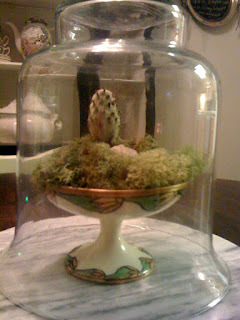 I have been on a major terrarium obsession the last few days! They are so cute! And, really, quite magical. I have all kinds of ideas, but not much in the way of supplies yet. I couldn't help myself from trying my hand at it with what I had in the house. This is the happy result. I had some live moss from Michael's and this beautiful little compote that my paternal great grandmother painted in 1930. I added some good quality peat moss in the bottom; moss, pebbles and magnolia bud to the top. The poor little magnolia bud was half crushed in a parking lot! I don't expect it to do anything, but I love the little bit of structure it adds. Such a simple little thing, but I love it! It looks very "Lord of the Rings" to me!